Whip the double cream and brandy together until thick enough to form peaks. Gently fold in the dulce de leche. In another bowl, whisk the egg whites until stiff. Carefully fold them into the caramel cream until well combined. Spoon the mixture into six pretty dessert glasses (about 150ml capacity each is ideal) and leave to set in the fridge for several hours. 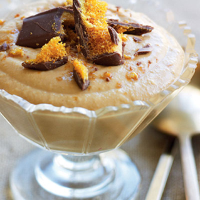 Just before serving, roughly slice or crush the Crunchie bars and scatter a little heap on top of each to decorate. The whip is best eaten on its own, but afterwards, a cup of spicy-sweet coffee will help you come back down to earth.